Rachel DeGraba focuses her practice on family law matters, such as divorce, equitable distribution, child custody and support. She recognizes the challenging emotions that are often present in domestic cases and strives to make every client feel comfortable and understood. Rachel was raised in Chesterfield County and enjoys giving back to the community that has given her so much. Prior to joining Owen & Owens, Rachel served as a law clerk to the Honorable Lynn S. Brice of the Twelfth Judicial Circuit of Virginia. Rachel earned her J.D. from the University of Richmond School of Law with honors in 2017. During law school, she was part of a small group of students who worked to create the online edition of the University of Richmond Law Review and served as the Online Editor of the journal. Rachel was also member of the Moot Court Board and served as Director of Communications for the Student Bar Association. 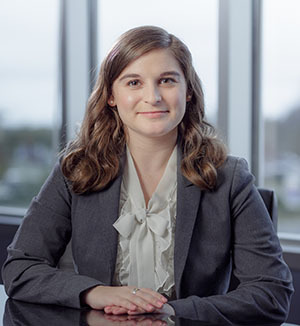 In 2014, Rachel graduated from James Madison University with honors, where she majored in Justice Studies and found her passion for the practice of law. Rachel is an active member of Hill City Church and the Junior League of Richmond. She resides in Chesterfield with her cat, Rosie.